After the South Garden was landscaped in 2008, we could not wait to start planting the borders. It therefore came as a shock when we discovered that the whole garden was infested with bindweed (Convolvulus). One of the great scourges that haunt gardeners’ nightmares, bindweed cannot be eradicated by even the most thorough weeding as its roots reach down to several metres depth in the ground. Before the introduction of chemical weed killers, gardeners in their despair used to grass over the affected areas and cut them as lawns for a couple of years which would, in theory at least, starve the bindweed of light and thus eventually kill it. 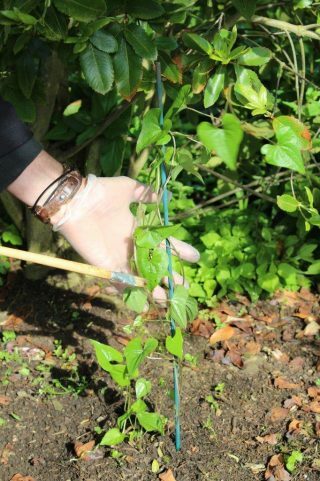 Nowadays, the standard procedure is to remove the plants from an affected border and leave it bare for about 2 years, during which time the bindweed is treated with glyphosate until it has been eradicated. Since we were not prepared to miss out on two whole planting seasons, we shortened the process: The bindweed was sprayed repeatedly over the course of one growing season. We used a diluted solution of glyphosate (about 50% of the recommended strength). Exposing the plant to a low dose of the toxin allows for transport back to the roots, which weakens the plant much more than killing a surface shoot with a standard concentration. Having dramatically reduced the infestation using this treatment, we then planted only evergreens and roses in the beds. Any emerging bindweed shoot was twisted around a stake to prevent it from invading the plants. Once the shoot had reached a length of about one foot, it was painted with a the same highly diluted glyphosate solution as before, using a paintbrush. Ten years later, we still use the same laborious process of staking and painting each shoot as it appears. After the treatment, it may take a few weeks for the shoot to die back, allowing for the poison to reach the roots. While we have not won a final victory yet, the infestation is kept under control with no impact on our planting activities. The same approach is used for enchanter’s nightshade (Circaea lutetiana) and bryony (Dioscorea communis) which affect some of our woodland gardens.